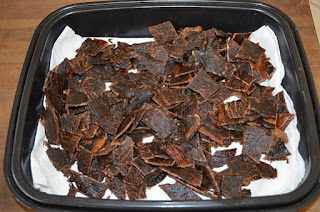 Beef jerky is a thin cut meat into a flake that is trimmed in fat, flavored with sour, salty or sweet sauce with dried over low heat or salted and dried. The result is a salty and half-sweet meat that does not need to be stored in the refrigerator. Jerky is an example of preserved food.